Less than 90 minutes from Phoenix Sky Harbor International Airport and only 30 minutes from Tucson International Airport, Dove Mountain has convenient access to transportation hubs without the noise, pollution, or traffic. Reach out to us and sign up for our newsletter to keep up on the latest news. Take I-10 west, exit Twin Peaks Road 4.5 miles to Dove Mountain Boulevard. Take I-10 east seventy minutes, exit Tangerine Road east 5 miles to Dove Mountain Boulevard. For property inquiries and community information. The team at Dove Mountain Properties knows Dove Mountain better than anyone. We should. 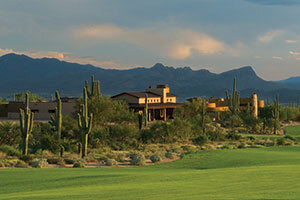 Our brokerage is owned by the original and ongoing developer of Dove Mountain. We’ve been here, dedicated solely to this community, since the beginning in 1999. That experience, our on-site location, and intimate knowledge of the community gives you a decided advantage when it comes to the most current information on what’s available in custom homes, homesites, re-sales and unlisted properties. That’s why buyers, sellers and homebuilders overwhelmingly choose Dove Mountain Properties. Get occasional updates. No spam. Unsubscribe easily.